Artistic Director of Kairos Italy Theater, actress, director, producer, critic, theater absolute lover. Where do you look for inspiration? Life, images, books, social/political issues: when something strikes me inside, it stays with me until I do something with it. For no reason at all engage in combat or pen a verse! Such a voyage of which we dream to the moon! If they’re in your own garden and grew by your hand! Artists/People who changed my theatrical life: the Nobel Prize winner Dario Fo who taught me how to breathe at theater, the actor Mario Carotenuto who taught me how to smell theater, the actress Lucilla Morlacchi who taught me how sacred theater is. And my parents, who made me experience theater since I was little. Is there anything you still dream of doing? A lot! I want to keep bringing Italian theater to the States and to open the first Italian theater in New York. And I want to do theater all my life! I feel most like myself when I …. Dance/Theater. What’s the one thing nobody knows about you? I am an open book, able only to hide deep sadness. I guess it’s a survival instinct! Laura Caparrotti is a director, actress, journalist, teacher, lecturer, consultant, dialect-coach, curator with an Italian accent. 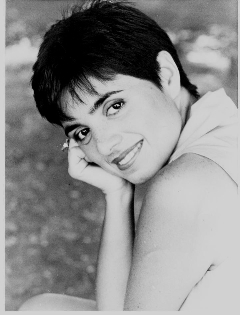 She studied and worked professionally for over ten years in Italy before relocating to NY where she founded KIT-Kairos Italy Theater, now the main Italian theater company in New York. And she can cook! For the past six years, the source of my inspiration has come from my research on Edmonia Lewis (1845-1911) who is the first woman of African-American and Native American heritage (Chippewa) to earn an international reputation as a visual artist. After reading an article about the discovery of one of her sculptures, THE DEATH OF CLEOPATRA, I immediately became curious about the life of this free black woman who was an artist at a time when most blacks living in America where bound by chains both physically and emotionally. The questions mounted, so I did a cursory search that rendered very little, which piqued my curiosity even more. I went deeper. To my surprise, there were very few absolutes in relation to Edmonia’s life, yet those that were absolutes were fascinating: attended Oberlin college in 1858, accused of attempted murder while at Oberlin, was defended by John Mercer Langston (the great-uncle of the poet Langston Hughes), moved to Rome in 1865, Frederick Douglass visited her studio in Rome. As a playwright, all of these incidents intrigued me. Edmonia’s success as a sculptor turned into a cloak that surrounded me as I made my way, at times steeping gently, through my own life. Edmonia’s ability to function in a society that at times was antagonistic to her freedom inspired me to explore new avenues in relation to my writing. The more I discovered about Edmonia the deeper my understanding became of myself as a woman and as an artist. At last I had to follow her path to Rome where it is assumed, for no one knows for certain, she died. As I searched for her resting place in Rome, I felt her presence pushing me forward and back to America with a newfound determination as an artist and as a woman. All of what I uncovered about Edmonia Lewis and myself is the foundation for my play titled WILDFIRES. Michael angel Johnson is a graduate from The Yale School of Drama in Playwriting, and her plays have been performed in venues from New York to California. Her plays often explore connections between the personal and the cultural. More info: www.michaelangeljohnson.com.